The Director of Dining Services manages and oversees the operation of large-scale food services. Working in hospitals, retirement residences and educational institutes, these director’s job description include the following – managing the food preparation and dining services, ordering food, preparing and delivering food, supervising cleaning activities, planning the menu, selecting or choosing healthy food choices, interviewing and hiring employees, maintaining records, ordering supplies, managing budget and adhering to the food rules and regulations with regards to safety and cleanliness. Candidates willing to embark on this line of hospitality service should have effective communication skills, networking and leadership skills. They should possess a deep knowledge of nutrition and diet aspects; they should also be proficient in food preparation and operations. Such directors must inherit professional dining etiquettes too. 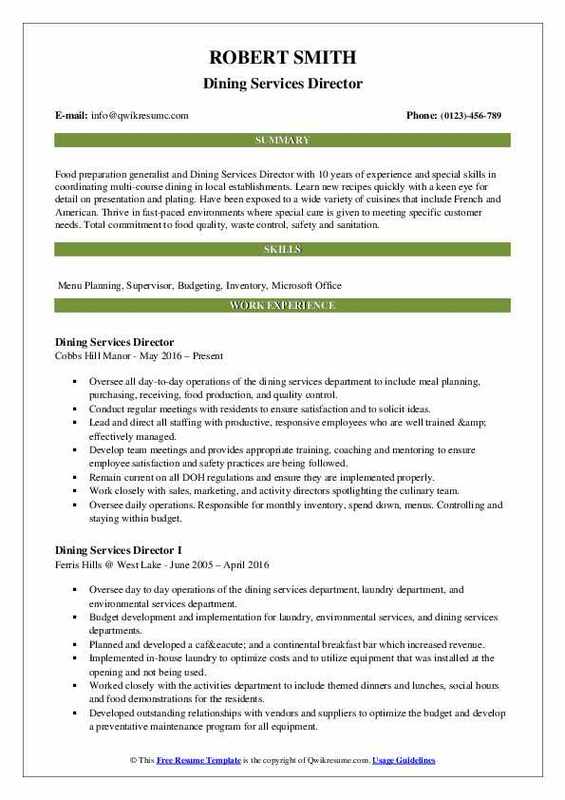 A formal education in the field of hospitality or culinary management or food service is common in Dining Services Director Resume. Headline : Performance-driven professional with established, successful management and customer service experience; whose accomplishments reflect outstanding leadership skills and a long-term focus on maximizing efficiency and productivity. Excellent communication and public relations skills. Effective time management and organizational skills. Dedicated to ensuring quality service and customer satisfaction. Ability to work independently, or as a fully engaged team member. Responsible for providing support and training to 13 facilities in both New Mexico and Colorado. Evaluation of the dietary operations and support in implementing quality improvement initiatives. 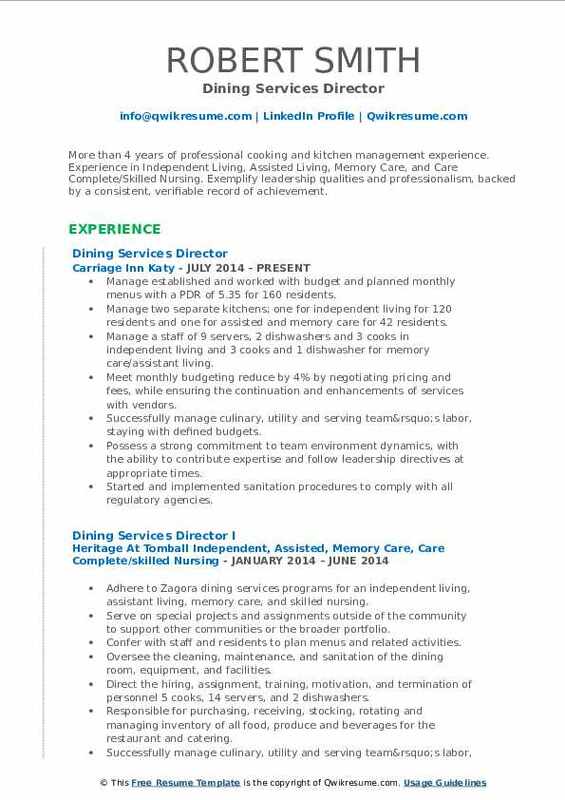 Conduct interviews, hiring, training, and the development of dining service directors and executive chefs. The implementation and standardization of policies and procedures for all facilities. Perform audits of the food nutrition services as required by city, state and federal agencies. Review of resident diets to make sure that staff is providing accurate meals that are compliant with daily resident diets and nutritional requirements. Assisting the facilities in managing monthly dietary budget requirements in all areas. Providing training of managers in the use of payroll purchasing software, clinical and production software used for all daily operations and diet management. Work directly with the center executive directors to improve overall dietary operations and resolve any service issues within the facilities. 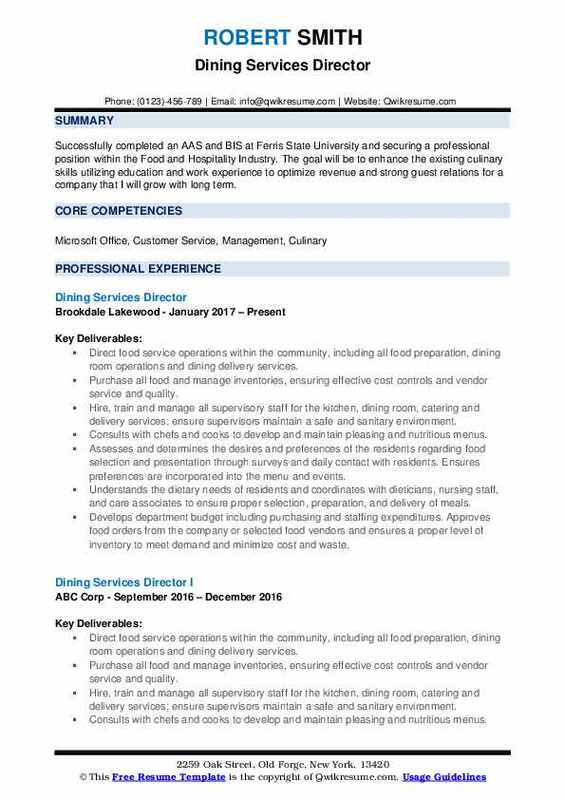 Objective : Successfully completed an AAS and BIS at Ferris State University and securing a professional position within the Food and Hospitality Industry. The goal will be to enhance the existing culinary skills utilizing education and work experience to optimize revenue and strong guest relations for a company that I will grow with long term. Direct food service operations within the community, including all food preparation, dining room operations and dining delivery services. Purchase all food and manage inventories, ensuring effective cost controls and vendor service and quality. Hire, train and manage all supervisory staff for the kitchen, dining room, catering and delivery services; ensure supervisors maintain a safe and sanitary environment. Consults with chefs and cooks to develop and maintain pleasing and nutritious menus. Assesses and determines the desires and preferences of the residents regarding food selection and presentation through surveys and daily contact with residents. Ensures preferences are incorporated into the menu and events. Understands the dietary needs of residents and coordinates with dieticians, nursing staff, and care associates to ensure proper selection, preparation, and delivery of meals. Develops department budget including purchasing and staffing expenditures. Approves food orders from the company or selected food vendors and ensures a proper level of inventory to meet demand and minimize cost and waste. Routinely monitors budget compliance and recommends changes as needed to maintain operational quality and resident satisfaction. 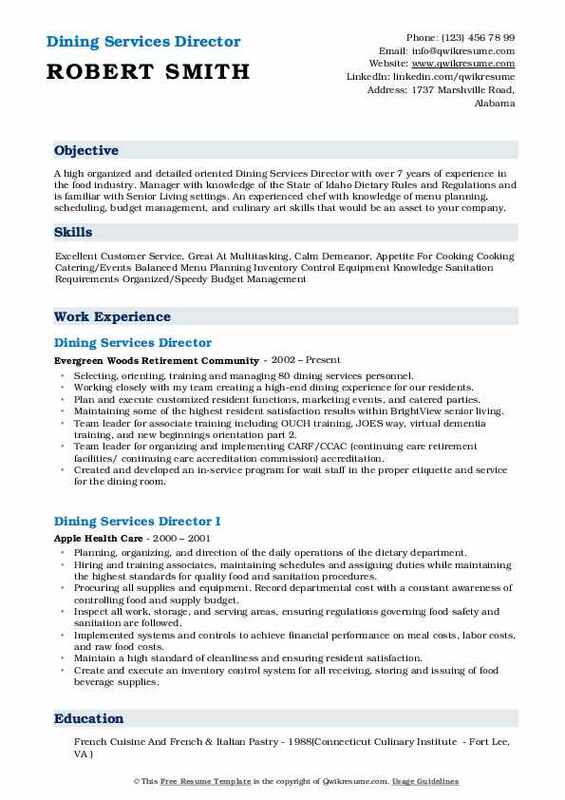 Summary : Food preparation generalist and Dining Services Director with 10 years of experience and special skills in coordinating multi-course dining in local establishments. Learn new recipes quickly with a keen eye for detail on presentation and plating. Have been exposed to a wide variety of cuisines that include French and American. Thrive in fast-paced environments where special care is given to meeting specific customer needs. Total commitment to food quality, waste control, safety and sanitation. Oversee all day-to-day operations of the dining services department to include meal planning, purchasing, receiving, food production, and quality control. Conduct regular meetings with residents to ensure satisfaction and to solicit ideas. Lead and direct all staffing with productive, responsive employees who are well trained & effectively managed. Develop team meetings and provides appropriate training, coaching and mentoring to ensure employee satisfaction and safety practices are being followed. Remain current on all DOH regulations and ensure they are implemented properly. Work closely with sales, marketing, and activity directors spotlighting the culinary team. Oversee daily operations. Responsible for monthly inventory, spend down, menus. Controlling and staying within budget. Follow menus and standardized recipes, and adjust according to resident preferences. Maintain a high standard of cleanliness and ensuring resident satisfaction. Objective : More than 4 years of professional cooking and kitchen management experience. Experience in Independent Living, Assisted Living, Memory Care, and Care Complete/Skilled Nursing. Exemplify leadership qualities and professionalism, backed by a consistent, verifiable record of achievement. Manage established and worked with budget and planned monthly menus with a PDR of 5.35 for 160 residents. Manage two separate kitchens; one for independent living for 120 residents and one for assisted and memory care for 42 residents. Manage a staff of 9 servers, 2 dishwashers and 3 cooks in independent living and 3 cooks and 1 dishwasher for memory care/assistant living. Meet monthly budgeting reduce by 4% by negotiating pricing and fees, while ensuring the continuation and enhancements of services with vendors. Successfully manage culinary, utility and serving team’s labor, staying with defined budgets. Possess a strong commitment to team environment dynamics, with the ability to contribute expertise and follow leadership directives at appropriate times. Started and implemented sanitation procedures to comply with all regulatory agencies. Train staff, make schedules and flow sheets, document on residents intake and weight changes, and cook. Inspect all work, storage, and serving areas, ensuring regulations governing food safety and sanitation are followed. Summary : Energetic professional seeks a growth-oriented position in which my skills in management and hospitality will be used to solve and meet company objectives. Overseeing meal preparation and service of 500+ meals daily among 3 dining rooms. Writing 13-week menu cycles, as well as a monthly "always available" menu. Overseeing budget of raw food, supplies, and labor in excess of $1.4 million annually. 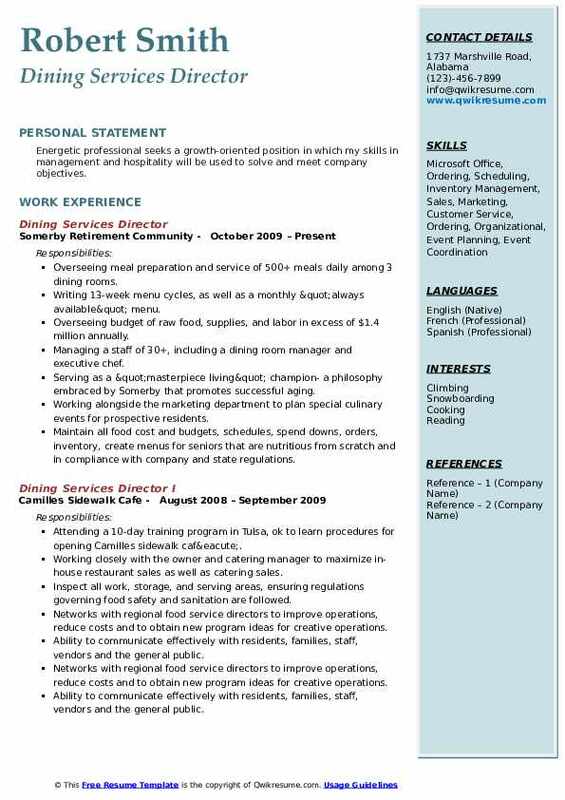 Managing a staff of 30+, including a dining room manager and executive chef. Serving as a "masterpiece living" champion- a philosophy embraced by Somerby that promotes successful aging. Working alongside the marketing department to plan special culinary events for prospective residents. Maintain all food cost and budgets, schedules, spend downs, orders, inventory, create menus for seniors that are nutritious from scratch and in compliance with company and state regulations. Opened brand new kitchen hired all staff, start-up orders. Created new and improved logs for HCCAP, maintained %99 and higher in state and auditing. Multiple cooking demos for marketing. Consult with chefs and cooks to develop and maintain pleasing and nutritious menus for residents. 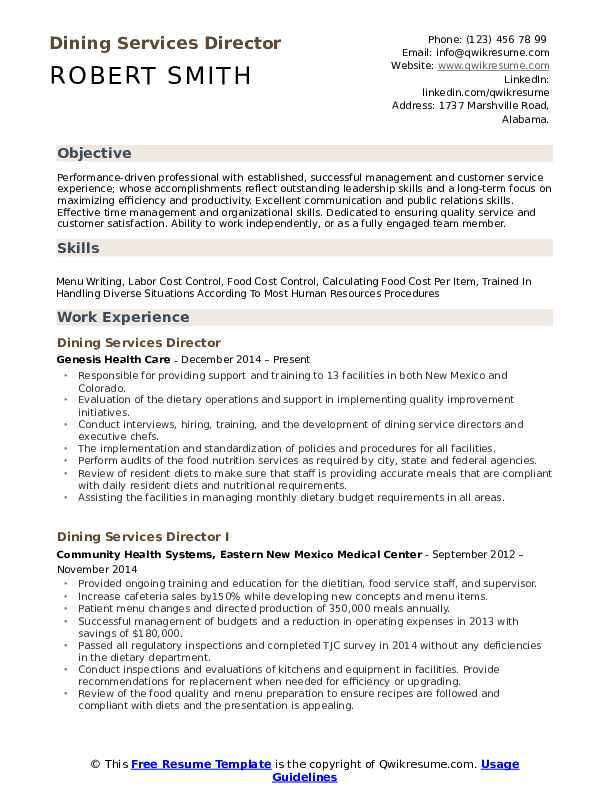 Summary : A high organized and detailed oriented Dining Services Director with over 7 years of experience in the food industry. 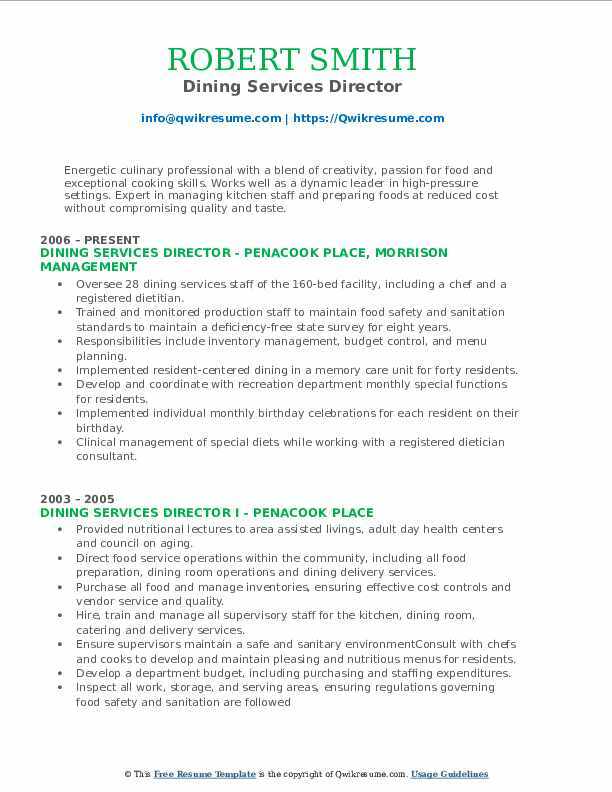 Manager with knowledge of the State of Idaho Dietary Rules and Regulations and is familiar with Senior Living settings. An experienced chef with knowledge of menu planning, scheduling, budget management, and culinary art skills that would be an asset to your company. Selecting, orienting, training and managing 80 dining services personnel. Working closely with my team creating a high-end dining experience for our residents. Plan and execute customized resident functions, marketing events, and catered parties. Maintaining some of the highest resident satisfaction results within BrightView senior living. Team leader for associate training including OUCH training, JOES way, virtual dementia training, and new beginnings orientation part 2. Team leader for organizing and implementing CARF/CCAC (continuing care retirement facilities/ continuing care accreditation commission) accreditation. Created and developed an in-service program for wait staff in the proper etiquette and service for the dining room. Implemented new recipes and menu cycles that immediately increased resident satisfaction at the Beverly Hills location while reducing food cost by 25% monthly. Work in tandem with the marketing and activities departments to ensure maximum occupancy. 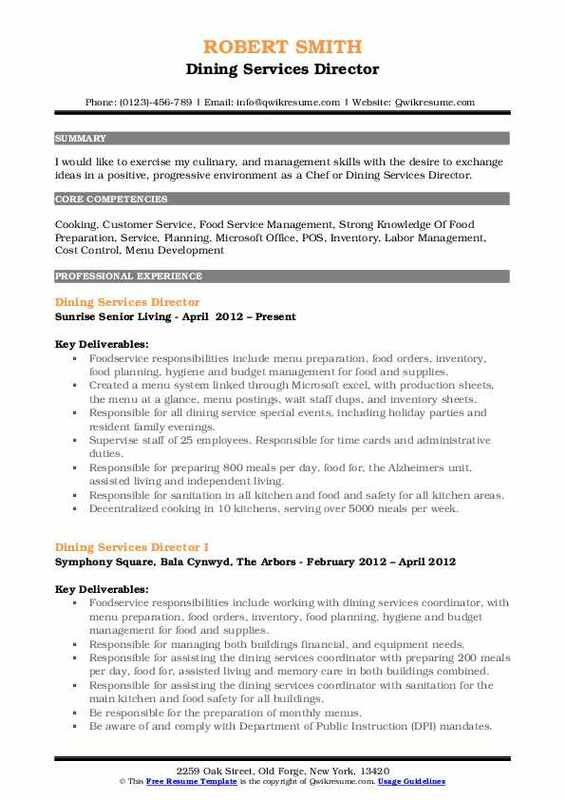 Summary : Energetic culinary professional with a blend of creativity, passion for food and exceptional cooking skills. Works well as a dynamic leader in high-pressure settings. Expert in managing kitchen staff and preparing foods at reduced cost without compromising quality and taste. Oversee 28 dining services staff of the 160-bed facility, including a chef and a registered dietitian. Trained and monitored production staff to maintain food safety and sanitation standards to maintain a deficiency-free state survey for eight years. Responsibilities include inventory management, budget control, and menu planning. Implemented resident-centered dining in a memory care unit for forty residents. Develop and coordinate with recreation department monthly special functions for residents. Implemented individual monthly birthday celebrations for each resident on their birthday. Clinical management of special diets while working with a registered dietician consultant. Develop a department budget, including purchasing and staffing expenditures. 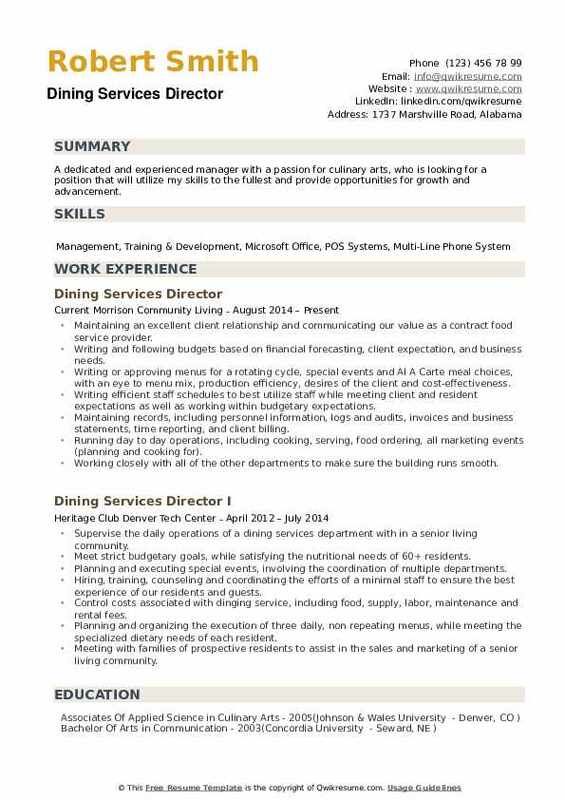 Headline : I would like to exercise my culinary, and management skills with the desire to exchange ideas in a positive, progressive environment as a Chef or Dining Services Director. Foodservice responsibilities include menu preparation, food orders, inventory, food planning, hygiene and budget management for food and supplies. Created a menu system linked through Microsoft excel, with production sheets, the menu at a glance, menu postings, wait staff dups, and inventory sheets. Responsible for all dining service special events, including holiday parties and resident family evenings. Supervise staff of 25 employees. Responsible for time cards and administrative duties. Responsible for preparing 800 meals per day, food for, the Alzheimer's unit, assisted living and independent living. Responsible for sanitation in all kitchen and food and safety for all kitchen areas. Decentralized cooking in 10 kitchens, serving over 5000 meals per week. Objective : To obtain employment that utilizes the skills I have gained through experience, achievement, and performance in the foodservice industry. More than 4 years of successful experience in customer service, restaurant management, problem-solving, training, hiring, planning/implementing proactive procedures and systems to avoid problems in the first place. Schedule within labor hours and ensure the quality of service on the floor. Hired the right leads and supervisor to oversee everyday department needs. Turned culture with staff from a negative experience with management, according to the annual employee survey, into a very positive relationship between frontline staff and management in dining services. Recruited almost a whole new staff of 26 servers due to lack of service on the floor within one month. Passed state and county surveys within the time since July with no tags or deficiencies. Oversaw inventory analysis of 8 facilities and reduced days of inventory by 50%. Responsible for ensuring service excellence and first-class customer satisfaction. Developing team members through appropriate training, coaching and mentoring, to ensure strong operational performance. 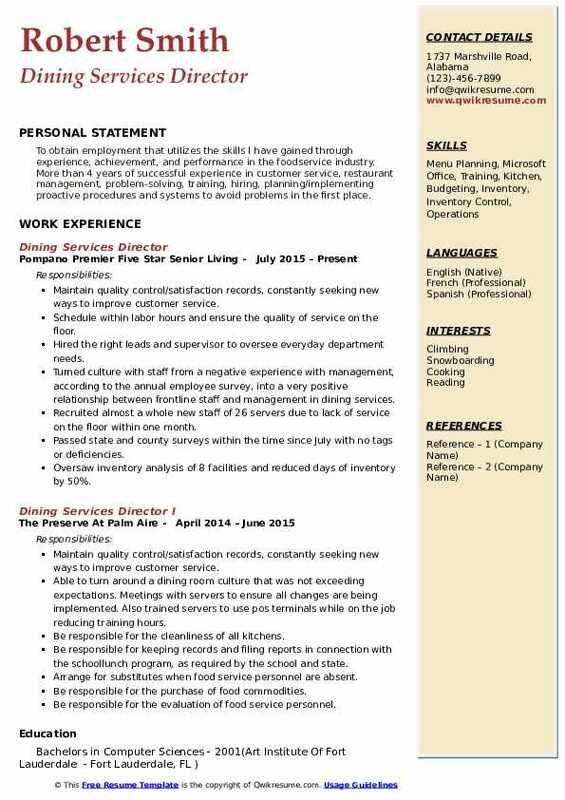 Summary : A dedicated and experienced manager with a passion for culinary arts, who is looking for a position that will utilize my skills to the fullest and provide opportunities for growth and advancement. Maintaining an excellent client relationship and communicating our value as a contract food service provider. Writing and following budgets based on financial forecasting, client expectation, and business needs. Writing or approving menus for a rotating cycle, special events and Al A Carte meal choices, with an eye to menu mix, production efficiency, desires of the client and cost-effectiveness. Writing efficient staff schedules to best utilize staff while meeting client and resident expectations as well as working within budgetary expectations. Maintaining records, including personnel information, logs and audits, invoices and business statements, time reporting, and client billing. Running day to day operations, including cooking, serving, food ordering, all marketing events (planning and cooking for). Working closely with all of the other departments to make sure the building runs smooth. Attending appropriate resident service committee meetings as well as conducting and monitoring resident attitude and food preference surveys.